Hello there and thank you for stopping by today. Today is the third day of the MFT April Release Countdown. Only 3 days until the new release (yay)! Be sure to head over to the MFT Blog for full set and die reveals for the day. 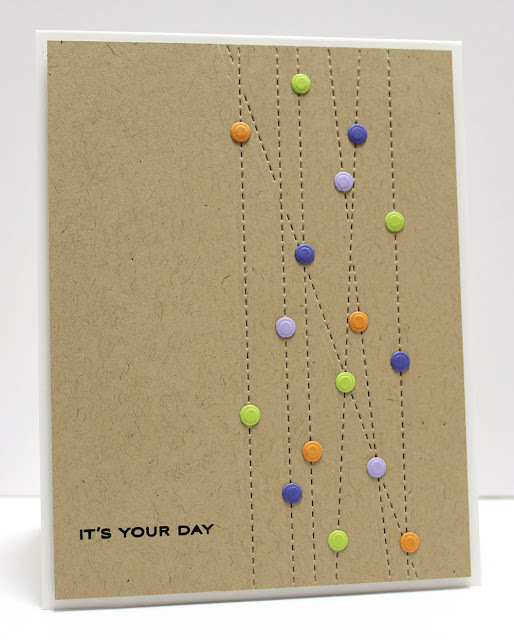 My card today features the gorgeous new Stitched Lines Die-namics. I love that is comes with small confetti 3 shapes so you can add a little pizazz to a VERY easy to use die. It's PERFECT for quick and easy cards! I used a small sentiment stamp from Birthday Sentiments stamp set. These products and many more will be available for purchase in just 3 days, on April 5 at 10 PM EST. Be sure to check out the MFT Blog to see what the rest of the team has come up with today. Your card is different, very cool! Very creative way to use the die - love it! A perfect CAS beauty on Kraft! Outstanding card that really uses the standout stitched sting die perfectly! I have to say this takes "clean and simple" to a whole other place. I love it. ALOT. Great masculine card if you just change the confetti colors. What a great card. Love your idea. Fun idea and way to use the stitched background. Love how you used the background stamp. This is just SO COOL! Love the colors.